Notebooks of many sizes seem to be popular at the moment, especially themed versions. Previously we had reviewed the Game of Thrones: Valar Morghulis Hardcover Ruled Journal by Insight Editions, which was a nice object in and of itself. Now, we have been sent the Moleskine Limited Edition Large Plain Notebook, Daenerys Targaryen version. The Moleskine notebook goes for themes rather than house banners. 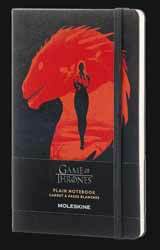 There are others on offer, but the Daenerys notebook is another nice object to own. The black cover is dominated by a striking rendition of a dragon head, within which we see Daenerys walking through a landscape holding the dragons when they were very young. The back cover is plain black. The hard cover notebook measures 21 x 134 cm and contains 240 plain pages on acid free, ivory coloured paper. Open the notebook up and you have a map of Westeros, as well as a lined section to write your name in. As well as an elasticated band to keep the book shut it also has a cloth bookmark. At the rear of the book you get a repetition of the map as well as an inner pocket, suitable for small objects. Mine also came with six GOT house stickers. It’s another nice notebook suitable for small drawings and your own scribblings, which overall has a feeling of a quality made object.